My feet were bleeding and swollen, my costume was missing feathers and sequins, but I’ve never been happier. For just a second, I stopped dancing – trying to take in the energy, the colors, the chaotic beauty of it all. To see an island nation that is isolated from the world, that suffers from droughts, and struggles to find clean water, to see the people come together and transform this quaint island – it’s spectacular, it’s phenomenal. The entire island plans for months in preparation for this 3-day event. They import materials, supplies and decorations – everything needed to make it a celebration you will never forget. You can’t have too many feathers, sequins, colors, or glitter. It’s extraordinary that an island of less than 13,000 people converts this quaint place into a dancing, singing, float-making, sewing, songwriting group of talented artists. As I stood blindfolded, with pins, strings and strips of satin fabric all over me, I knew I had made the right decision. 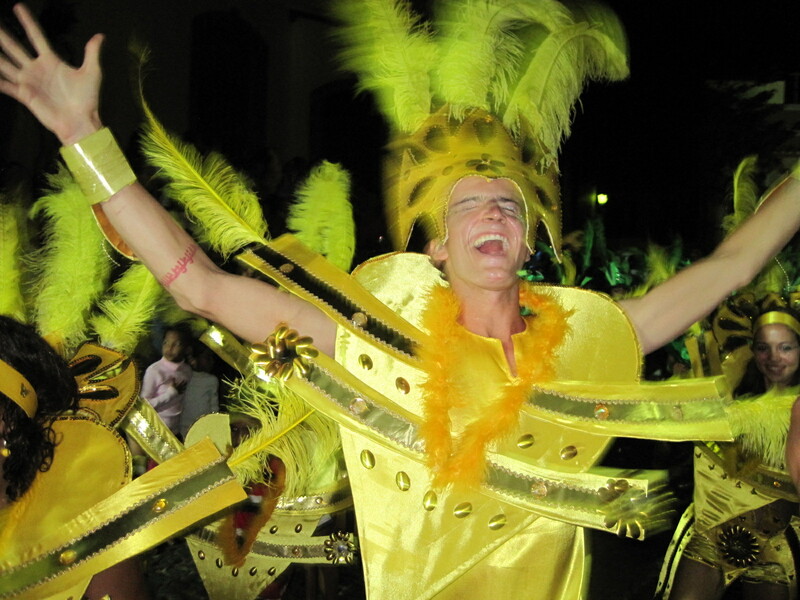 2011 marked the first year that female PC volunteers dressed for Carnaval. 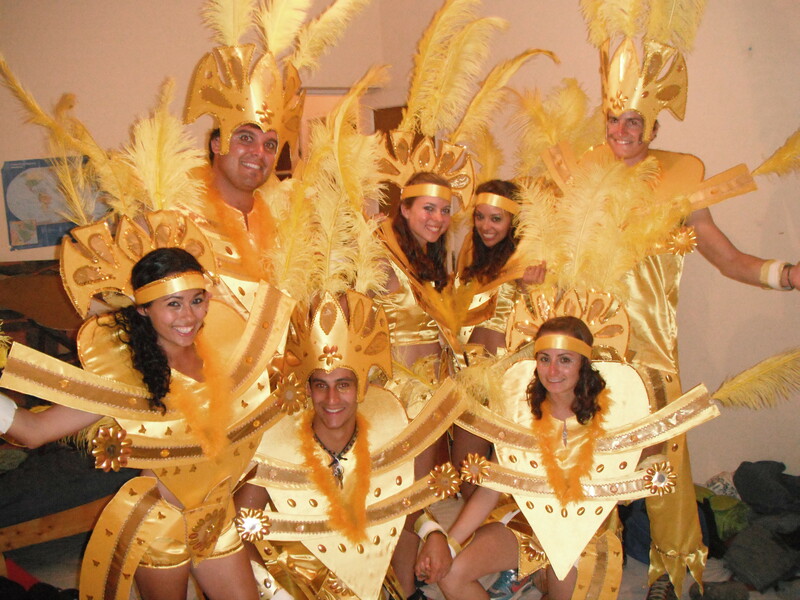 We were excitedly nervous about our costumes – not knowing what to expect, only hearing rumors about past Carnaval attire, and not able to see the actual outfits until the night of the parade. Everything is hush hush. Before the first night of the parade, you are fitted for your costume, you practice the official dance and you learn the annual song. Yet, most details are kept secret. No one can see the dressed teams until the first night of the parade. Once you are dressed, no one can leave the building. Thus, we waited with anticipation, wondering if the parade was ever going to begin. 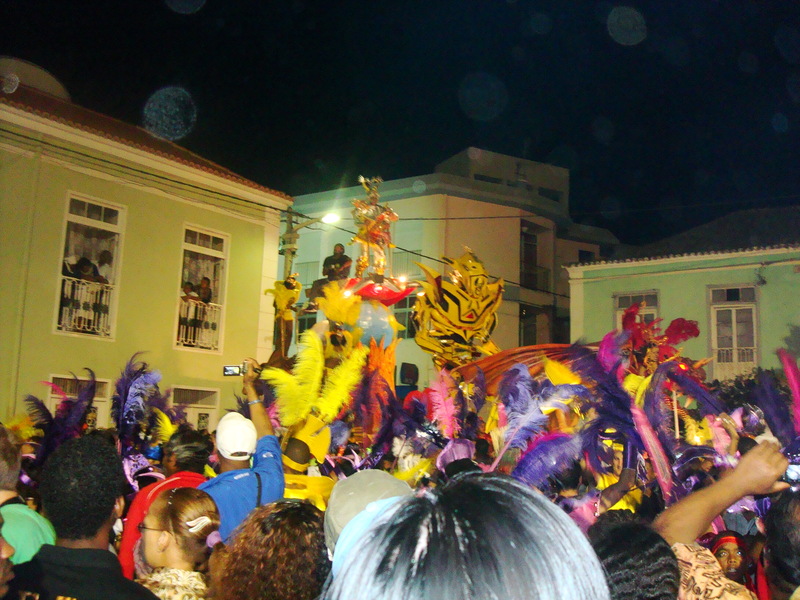 Although there were many glitches, including mending our costumes with medical tape because the island was clear out of staples, the parade starting at 6am instead of midnight, and searching the island for our tailor, our mood could not be dampened. The smiles couldn’t be wiped off of our faces. As we danced down the cobblestone streets, and music was blaring from every float, everyone was happy, alive and celebrating. We danced, we sang, we shared, we joined a community. It started with costume preparations, dance practice, lyrics, feathers and glitter, and it ended with excited chatter about next year. Dressed and ready to dance! You should totally wear this on your final flight back to America!